The PM's first responsibility is quality. This means quality of the final product along with quality and management throughout the project. The PM may belong to an organization that does not embrace TQM. The Project Manager may belong to a firm that does not even know what TQM is all about. However, the process that propels TQM must be used by all ARCHITECTURAL OR ENGINEERING firms that intend to grow and prosper, whether they use the title of TQM or not. The process of TQM is merely those things that an organization should have been doing in years past as well as the present. The Project Manager can still utilize TQM or other quality processes in his or her daily program. These three factors must be considered throughout all of the work that is involved with any project. The Project Management (PM) needs to employ all the tools that define TQM to ensure a successful project. This means treating associates with professionalism as well as firmness, satisfying the customer's needs, and keeping management appraised at all times. 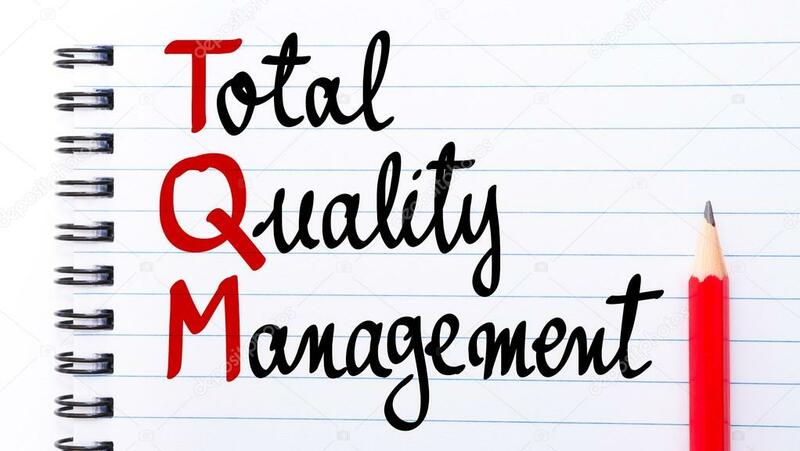 TOTAL QUALITY MANAGEMENT (TQM) is quality of management and not managing quality. This is one of the many definitions of TQM; however, it also means placing all the required processes in operation, providing the product that satisfies the customer's needs, and constantly improving under proper leadership. TQM is somewhat new. Many people have not heard of the process. Some feel that it is abstract and mysterious; however, it will work for different types and sizes of organizations, both manufacturing and service related. It will not work the same for every organization. It must be tailored to fit each and every organization. Focus all the organization's energy in achieving total customer satisfaction. Organize all work as a process. Seek continuous improvement for individuals and the organization. You must remember that a customer will be the person you work for, plus his or her customer, and on and on. You will have many customers, including your staff at times. To achieve the three goals above, you do not do things the way you have always done. You now face a customer and try to understand his or her needs. Once you understand what customers want, try to accept what internal changes may be necessary in order to meet their needs. The first concept must be directed toward, and become a priority for, each employee. They must learn that their task is to satisfy their customer and the customer's customer. They must know who the customer is and what they need. They must also be made to feel that they are an important part of the organization. The second key concept requires focusing on the process. This will be discussed in detail later; however, a process is a pattern of activities that is used a number of times in the same manner. A project should not just be started; it should be started with a plan or process. That plan or process should be used, corrected when needed, and approved with each use. A standard process will help eliminate mistakes; before you control or use a process, however, you must understand and know how to use it. The third key concept requires the total participation of all staff at all levels. Employee participation is very much misunderstood. Some believe it is a democracy where all decisions are made by voting. Nothing could be farther from the truth. The goal of employee participation is to harness the most valuable resources the firm has, that is, the knowledge of the staff. The responsibility given the employee must be equal to his or her experience and training. It is not possible to give an employee a job without proper training and tools. Also, it means that the firm must allow each employee to pursue a job for which he or she was trained. Management must be in accord with such a philosophy. They must agree to let employees work, make designs, etc., without interference. TQM cannot be experienced today and not tomorrow. Neither can management not practice TQM while the remainder of the staff does. Managerial leadership is the last concept that must be practiced. The task of a manager is to conduct affairs and keep the workplace running. A leader must precede and keep the momentum going. You are a leader if people want to follow in your footsteps. A leader must have a vision and know where he or she wants to go. Then they must concentrate and attain that goal. Leadership will be accomplished by a good example. Leadership requires planning, monitoring, and directing. It also requires providing for a proper environment for the staff. This environment may be physical, emotional, and/or psychological. Again, the PM may not be able to place a TQM process in operation due to management's decision; however, the key concepts of TQM can be practiced to some degree within the framework of a PM's realm.